Harvesting at the right time: manual or mechanised? LinkExchange SearchMe WhatWeDo AboutUs Sitemap Next page When to harvest potatoes. In order to guarantee a successful harvest, it must be done quickly, and at the right time. Harvesting quickly and on time are the key to a good harvest. If you harvest too late, the potatoes and onions will sprout (germinate), resulting in a poor quality product which will continue to sprout right up until it is consumed. Harvest too early, and the potato and onion yield will decrease. The potatoes will be small with thin skins, and the onions will sprout constantly. Onions and potatoes harvested at the wrong moment cannot be stored. See also: harvesting potatoes at the right time and harvesting onions at the right time. Manual harvest and mechanised harvest, with relation to harvesting on time. except in the case of small harvests, with less than 4 hectares of land. 1. It is relatively expensive. The bigger the harvest, the more expensive it is. In small fields, with 3-4 hectares, the cost of a manual harvest is similar to that of a mechanised one. The more land, the more expensive a manual harvest becomes, and the cheaper a mechanised harvest. See: Cost per kg of a mechanised harvest with relation to land area. 2. You need a large window of opportunity (with regards to weather). Harvesting is slow, organising so many workers is bothersome, and it all takes a very long time. That's if you can even find enough workers. Remember that everyone in the area will be harvesting at more or less the same time. 3. A significant amount of produce is left in the field during a manual harvest. Advantages of a mechanised harvest. 1. Provided that the harvesting machinery is kept spick and span, once you decide to harvest, the process can begin immediately. 2. A mechanised harvest is very quick, and you can cover almost one hectare per hour with just 3 or 4 workers. 3. The true cost of a mechanised harvest, despite the investment required to buy the machinery, is very low, sometimes less than one dollar cent per kg. See: Cost per kg of a mechanised harvest with relation to land area. 4. 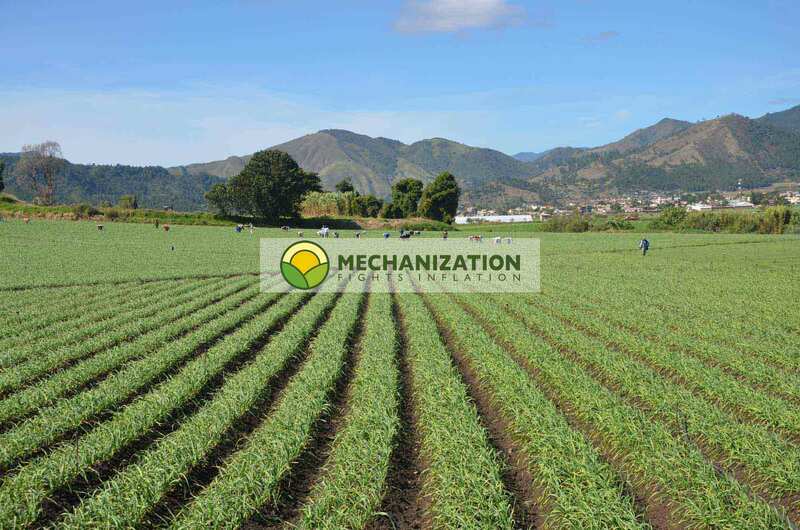 During a mechanised harvest, all of the produce is collected, unlike a manual harvest; the smaller onions or potatoes are also picked up, and a significant amount of the rest of the produce. 1. A mechanised harvest requires a much smaller window of opportunity than a manual one. In other words, when the produce is ready to be harvested, and weather permitting, harvesting can begin straight away (even at night!). See: Forecast: Rain! Two hours later, this harvest was stored away and safe from harm. 2. The bigger the mechanised harvest, the lower the cost per kg of the produce. 3. A mechanised harvest leads to increased yields, because there is no wasted produce left in the field. 4. Last but not least, the farmer who mechanises their harvest has more time for other tasks, instead of having to organise dozens of harvest labourers. Next up: When to harvest potatoes. That's why a mechanised harvest is always better than a manual one. HOWEVER, mechanising agriculture should not start with the harvest. On the contrary; the harvest is one of the last phases you should mechanise in the ''field to fork'' process. Well, a mechanised harvest will create a flow of 30-50 tonnes of produce per hour. What are you meant to do with that much produce if you cannot handle or store it? having onions and potatoes available all year round. a properly weighed and packaged product. But be careful! There are some technicalities within the mechanised harvest which you ought to bear in mind, especially when it comes to onions.